Gabriele Finaldi was the first to point out that the seated pope seems to be Pius V (Ghislieri), the Dominican, pro-Spanish pontiff who reigned from 1566 to 1572. As Cardinal Ghislieri, he held the office of grand inquisitor under the two previous pontiffs, Paul IV and Pius IV. Comparison of the visage and physique of the pope in the drawing with those in the many surviving portraits of Pius V shows notable similarities, the most conspicuous being his large, hooked nose, his emaciated face and his forward-leaning head, protruding uncomfortably as though he suffered from arthritis of the neck. An especially large number of painted and engraved likenesses of Pius V are known, since he was raised to sainthood in 1712. Among the pope´s many attainments was his exact observance of the decrees of the Council of Trent. In the right transept of S. Maria Maggiore, Rome, over the pope´s tomb, the marble effigy of Pius V (1587) by the sculptor Leonardo Sormani (documented from 1530-1589), provides a good, official likeness of the man, in many ways akin to that shown here. The standing goddess who introduces the kneeling bearded man to the pope is Minerva. She personifies wisdom and, in the Renaissance period and after, was often regarded as the patroness of learning and the arts. As far as the identification of the supplicant himself is concerned, Florian Harb (2004) has suggested this could bee Giorgio Vasari (1511-1574). The possibility it could be Michelangelo is out of the question on a number of grounds. So close is the profile of this balding, bare-headed, bearded man in the Prado drawing to that of Vasari as portrayed in the marble bust of him in old age by an anonymous Italian sculptor, in the Casa Vasari at Arezzo, that Harb´s suggestion is very likely correct (Arezzo, 1981, no. IX, 3, and figs. 313-15). In contrast to Pius V´s large, hooked nose, Vasari´s was smaller and slightly retrousse, just like the man in the drawing. Moreover, his hair was balding at the sides, leaving a narrow outcop of curls jutting over the center of his forehead. Far more to the point, however, on 27 June 1571, Vasari was created "cavalier spron d´oro" by Pius V and during the course of a special ceremony was granted a "cavalierato di S. Pietro" (Arezzo, 1981, p. 310). In the marble bust of Vasari in the Casa Vasari at Arezzo, the pendant to the pontifical order worn around the artist´s neck is decorated with the Ghislieri arms. According to Karl Frey, Vasari was named cavaliere on 28 June and not 27 (Frey, 1930, p. 588). Vasari valued the gold necklace he had received at 80 scudi. 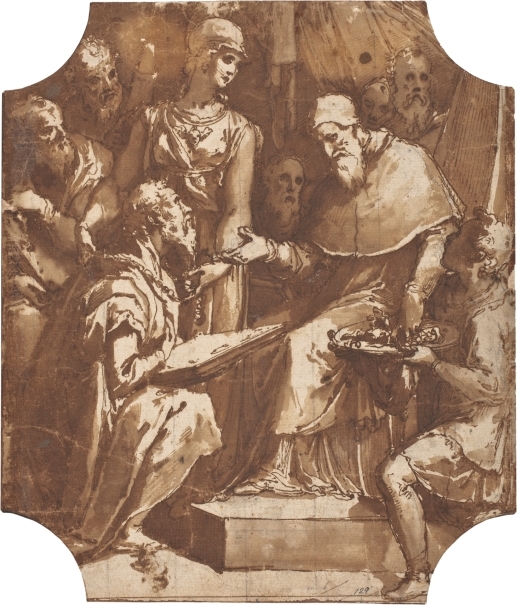 In the drawing, Minerva places the chain of office around the neck of the cavaliere, while the pope, in a somewhat inelegant action, dips his hand into a large purse held by the kneeling page on the right, as if to hand money or treasure to the kneeling man. The object resembling a book with an ornamental binding held in the kneeling man´s left hand -two of the bearded attendants to the supplicant also each hold such objects- is hard to explain, though it may be an allusion to Vasari´s art-historical writings. If the proposed identification of the protagonists in the Prado drawing is correct, then the artist responsible for the drawing cannot be Taddeo, for he had been dead for five years in 1571. Both Vasari and Federico Zuccaro were in Rome in the early 1570s, and it cannot be excluded that some sort of official project commemorating the occasion of Vasari´s elevation was awarded to the latter. As far as the style of the drawing is concerned, this fits in well with that of Federico at this time, notably his drawings for the decoration of the Cappella Maggiore in the church of S. Caterina dei Funari, Rome, where he worked in 1571-1573. Among these is the large-scale compositional study in pen and brown wash of the Disputation of Saint Catherine of Alexandria in the National Gallery of Art, Washington, which contains a number of close analogies in figure type and handling to the Prado sketch (inv. no. 1981.89.1: Milwaukee and NewYork, 1989-90, no. 64) (Text drawn from Turner, N.: From Michelangelo to Annibale Carracci. A century of Italian drawings from the Prado, Art Services International-Museo Nacional del Prado, 2008, pp. 130-133). Height: 232 mm. ; Width: 198 mm.